College is a huge financial undertaking. With costs increasing every year and the prospect of too much student debt at the forefront of many families' minds, it's more important than ever to be an educated college consumer. Go into the planning process wisely with these four steps. A few years before you need to start paying tuition bills is a good time to look at your college savings. How much have you saved? Are you currently making monthly contributions? Can you increase them? How much will you have saved by the time your child graduates from high school? 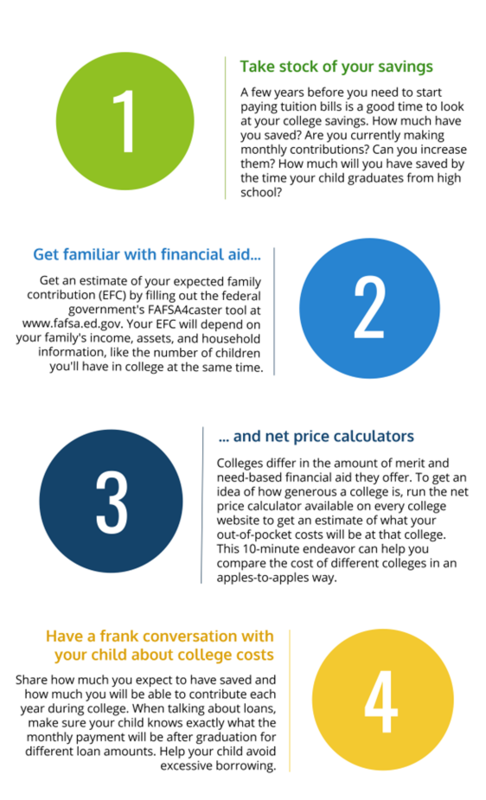 Get an estimate of your expected family contribution (EFC) by filling out the federal government's FAFSAcaster tool at www.fafsa.ed.gov. Your EFC will depend on your family's income, assets, and household information, like the number of children you'll have in college at the same time. Colleges differ in the amount of merit and need-based financial aid they offer. To get an idea of how generous a college is, run the net price calculator available on every college website to get an estimate of what your out-of-pocket costs will be at the college. This 10-minute endeavor can help you compare the cost of different colleges in an apples-to-apples way. Share how much you expect to have saved and how much you will be able to contribute each year during college. When talking about loans, make sure your child knows exactly what the monthly payment will be after graduation for different loan amounts. Help your child avoid excess borrowing.